Finishing Total 200 is always a huge reward- no matter how many attempts you’ve tried. This event is brought to you by Reach Above, Inc.
Total 200 is a fully supported double century bike ride (200 mile and 200 kilometer options), thanks to our volunteers and sponsors. It’s a full day, and their support makes all the difference when you’re trying to go the distance. The day starts at 5:00 am with check-in, orientation and meet and greet. Pack your special needs bags into the lunch vehicle—so your things will be waiting for you when you get to lunch at the mid-point. We’ll review the course and rules of the ride, then be ready to roll at 6:00 am sharp. From our starting point, we’ll head toward the US Capitol before following Pennsylvania Avenue towards Maryland. You’ll find check points located about every 25 miles along the route, where you can refuel on nutrition products, food, fruit, and water. Our stop at mile 123—Port Tobacco—is a full lunch stop (mile 69 for the 200k ride). Once we return, we’ll be greeted with a post ride celebration and time to bask in your accomplishments with old and new friends alike. 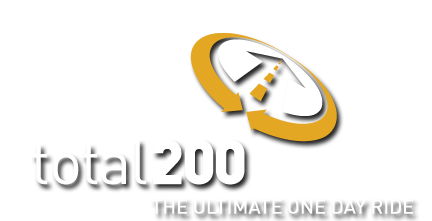 There are two routes: a 200 mile route and a 200 kilometer (125 miles) route taking place on the same day. Actually much of the route is the same with a small portion of the 200k cutting across to merge with the return route of the 200 miler. More information is posted on the route page.